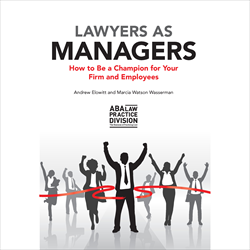 Lawyers as Managers: How to Be a Champion for Your Firm and Employees (ABA 2017), Marcia Watson Wasserman and Andrew Elowitt. The California Guide to Opening and Managing a Law Office, “Finding, Recruiting, and Hiring Staff, Clerks and Attorneys,” 2008 State Bar of California. (Co-authored chapter with Roberta J. Burnett). Guide for Senior Lawyers, “Transitioning Your Practice,” Los Angeles County Bar Association, September, 2008. (Authored chapter). “Novel Ways to Train and Develop Associates,” July/August 2018. 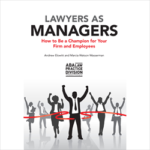 “Embracing the Champion Manager Mindset,” co-authored with Andrew Elowitt, May/June 2017. “Lessons from Women Law Firm Leaders,” November/December 2016. “Firm Culture: Obstacle or Catalyst for Strategic Change,” July/August 2015. “Associate Development: How Large Firms Are Leading the Way,” September/October 2012. “Six Tips for Managing Virtual and Telecommuting Employees,” co-authored with Andrew Elowitt, September 26, 2017. “How To Turn Conflicts into Opportunities,” co-authored with Andrew Elowitt, November 14, 2018. “Five Traits of Champion Managers,” co-authored with Andrew Elowitt, October 12, 2017.